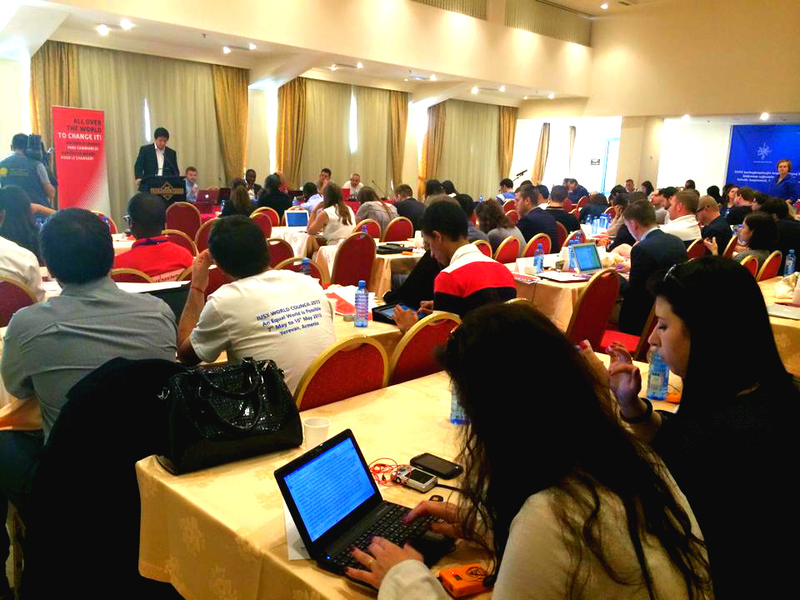 YEREVAN—The International Union of Socialist Youth (IUSY) World Council unanimously passed a resolution on the Armenian Genocide Centennial, demanding reparations for the crime, condemning its denial and dedicating to educate IUSY member organizations about the crime worldwide. The World Council, which took place in Yerevan and was hosted by the Armenian Youth Federation (AYF) of Armenia, adopted the resolution on May 9. Titled, “An Equal World Is Possible,” the IUSY World Council includes participants from 60 countries, with over 160 delegates representing various socialist youth organizations, in addition to over two dozen AYF representatives from Armenia, Artsakh, and the Diaspora. 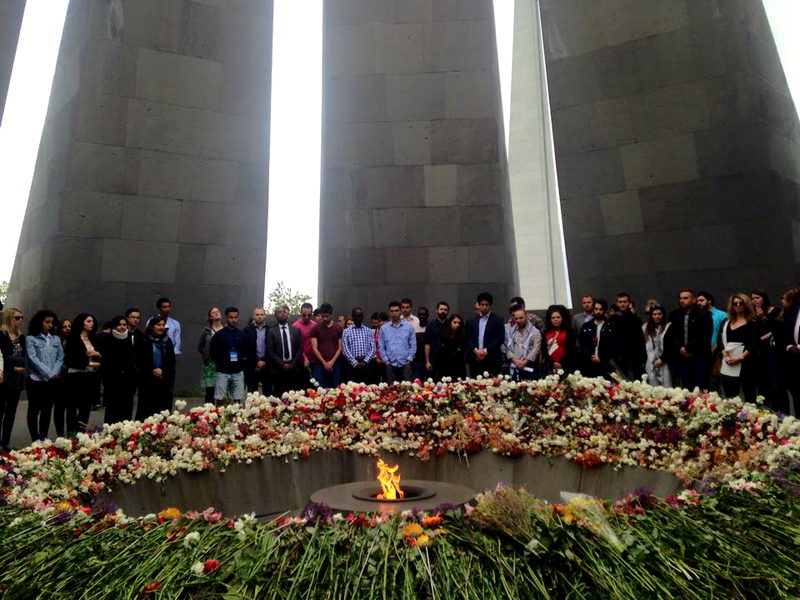 Earlier that day, participants of the council paid their respects to the 1.5 million victims of the genocide at the Armenian Genocide Memorial at Dzidernagapert. They also visited touristic sites and museums in Yerevan to educate the delegates of Armenia’s ancient history as well as the post-Soviet nation’s current development and innovations. Chadoian added that Armenians will now be further exposed to socialist values in action and see that socialism and social democracy are in the best interest of the Armenian people and Armenia’s development, as hundreds of socialist youth take up the mantle of Armenian cause. Other special guests who made remarks throughout the weekend included Socialist International Vice-President Mario Nalbandian, who is a former Armenian Revolutionary Federation Bureau member; IUSY President Felipe Jeldres; IUSY Secretary General Evin Incir; and Giacomo Filibec of the Party of European Socialists. The International Union of Socialist Youth (IUSY), being a faithful follower of the principles of justice, democracy, equality, and human rights, reaffirms its position on the Armenian Genocide as the world commemorates the 100th anniversary of the first Genocide of the 20th century. The Armenian Genocide opened a whole new circle of genocides that were encouraged by the impunity of the perpetrators of the first genocide as well as inspired by its techniques and genocidal methods. IUSY condemns the genocide against the Armenian people which was planned and carried out by the Ottoman Empire and various regimes in Turkey in 1915-23. During these years more than 1.5 million Armenians, living in their ancestral homeland (what is largely known as Eastern Turkey today), were brutally exterminated; their heritage was confiscated and largely destructed. The small number of Armenians who survived was spread all over the world. IUSY strongly condemns the denial of the Armenian Genocide by the Turkish government as well as all the attempts of the Republic of Turkey to mute and bribe every initiative that is aimed at the recognition and reparation of the Armenian Genocide. IUSY believes that the denial of the genocide is a double crime that ought to be punished and has nothing in common with the right of freedom of expression. 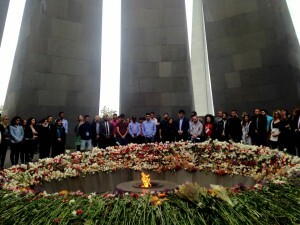 IUSY supports the Armenian Youth Federation’s (AYF) and the Armenian people’s struggle for the recognition and reparation of the Armenian Genocide by calling upon Turkey to start an immediate process of eliminating the consequences of the Armenian Genocide and initiate a process of restoration of the rights of the Armenian people. IUSY believes this is the only reliable road to reconciliation of the two countries and nations. IUSY sees education as one of the most vital and constructive ways of fighting any form of extremism. With this, we call upon our member organizations to spread the knowledge of the Armenian Genocide, because only by knowing and condemning past genocides can we prevent new ones from taking place. On the eve of the Armenian Genocide Centennial, the Armenian Youth Federation – Western United States concluded its 100 Days of Action campaign. In the past 100 days, the AYF has planned and executed daily actions to raise awareness about the Armenian Genocide, divest funds from the Republic of Turkey, and present the Armenian community’s demands of recognition and reparations to government of intolerance. The 100 Days of Action began on Jan. 14 with a vow to advance the Armenian Cause through at least one action per day. For 100 days, we showed the world that despite the Ottoman Empire’s attempt to annihilate our people and the present-day Turkish government’s best efforts to deny this genocide, the Armenian people survived and we continue to fight for justice for the 1.5 million souls that were brutally murdered 100 years ago; for our lands that were wrongfully taken from us; for reparations to make amends for the loss, pain and devastation; in the name of humanity and morality. Throughout the 100 Days of Action, the AYF continued its 82-year tradition of on-the-ground, grassroots activism in the community through educational forums, cultural displays, political lobbying and weekly social media campaigns. We highlighted Armenian achievements, the Armenian language and culture, and several other successes in the past 100 years through the #TurkeyFailed hashtag. Stories of genocide survivors were shared every Tuesday to illustrate the pain and suffering our forefathers endured. More importantly, these stories demonstrated our rise from the ashes; our will to live on, to hold on to our roots, our language, our culture. The AYF also broke new ground during the 100 Days campaign with brand new approaches. The Divest Turkey initiative has found success across two major UC campuses so far. The initiative was started by the AYF in order to pull over $72 million in investments made by the UC school system in the government of Turkey. Essentially, UC students’ tuition is funding Turkey’s genocide denial campaign. At UCLA, the resolution passed the student government unanimously. A few weeks later, a similar resolution passed unanimously in Berkeley, despite heavy opposition. The AYF will take the initiative across all UC campuses, and eventually to the UC Regents. This week, a similar resolution was introduced in the California State Assembly, which, if passed, will prohibit the investment of state retirement funds in Turkey, taking the AYF’s initiative from student government to state legislature. Through another effort, the AYF gained unprecedented social media attention when we staged a “die-in” demonstration in front of the Staples Center, as tens of thousands of fans were leaving a Los Angeles Lakers basketball game. Perhaps the most memorable event in the campaign, the “die-in” took place on a rainy day in Los Angeles, with AYF members simultaneously dropping to the wet ground in order to bring attention and awareness to the Armenian Genocide in the busy plaza. At Venice Beach a few weeks later, AYF members grabbed the attention of passersby with posters and multilingual pamphlets about the genocide. Similar to the “die-in”, the Venice Beach event tapped into an audience largely unfamiliar with the Armenian Genocide. Every Wednesday, we took to social media to thank governments around the world who have recognized the Armenian Genocide. We also sent the letters to their respective embassies to thank them for being champions of justice. Mondays throughout the 100 Days of Action were called “Demands Mondays.” Along with Armenian high school students, we delivered thousands of letters to the Turkish Consulate in Los Angeles outlining the Armenian community’s demands from the government of Turkey. Towards the end of the 100 days, these deliveries were met with hostility from the consulate and building security, who denied us access to the building. They were scared to face us, to face the truth. On two separate occasions, AYF members took the campaign to the streets of the Greater Los Angeles area to, once again, raise genocide awareness. In a line of cars, we marched through the streets of Hollywood with signs and banners on our cars. The following day, we rode our bikes through the San Fernando Valley in the Cycle Against Denial. On April 17, one week before the commemoration of the genocide centennial, we displayed the Soles of Survivors exhibit in front of the Turkish Consulate. It displayed Armenian Genocide commemoration monuments from around the world with pairs of shoes walking away towards the consulate’s door. The shoe soles personified the souls that marched in the desert and perished in the genocide. They also represented the souls of those who are now marching toward justice and reparations for the victims. A day after the conclusion of the 100 Days of Action, we took part in the March for Justice on April 24 to mark the 100th anniversary of the genocide. The historic march accumulated tens of thousands of demonstrators and garnered widespread media attention, shining a bright light on our Cause. The 100 Days of Action are long gone now, but the fire within us is burning bigger and brighter. Our objective remains the same. Our will to fight is only growing. We will continue to work until we achieve recognition, restitution, reparations and the just resolution of our Cause. (LOS ANGELES, April 17, 2015) – The Armenian Youth Federation – Western United States staged a demonstration in front of the Turkish Consulate in Los Angeles this morning exhibiting posters of Armenian Genocide monuments from around the world and shoes on the sidewalk leading into the Turkish Consulate. The AYF also attempted to deliver a letter to the consulate outlining the Armenian community’s demands from the Turkish government, but members were not allowed into the building. Security guards stopped members from proceeding to the Consulate floor and instructed them to send the letter in the mail. This attempt follows several such efforts by the AYF in recent months to gain the Turkish Consul General’s attention in regards to the genocide. As part of the 100 Days of Action campaign, AYF members have been delivering demand letters to the consulate every Monday. The 100 Days of Action campaign will continue in the coming week, concluding on April 23. 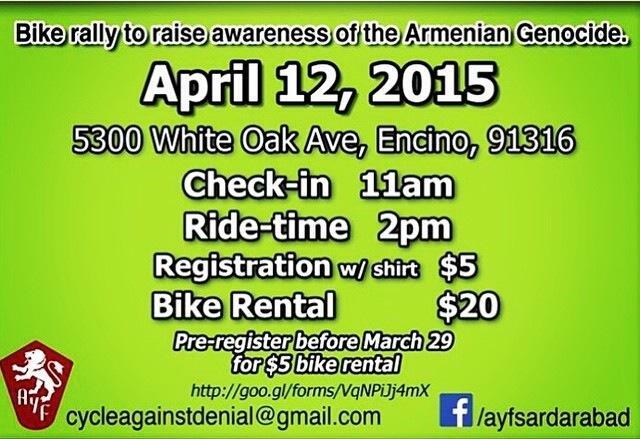 The following day, the AYF will take part in the March for Justice from Little Armenia to the Turkish Consulate. 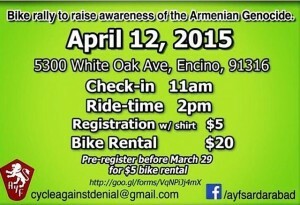 (ENCINO, Calif., March 30, 2015) –On April 12, the Armenian Youth Federation San Fernando Valley “Sardarabad” Chapter will host its seventh annual “Cycle Against Denial”, a bike-a-thon to raise awareness about the Armenian Genocide. This year’s event circles over 10 miles beginning and ending at Holy Martyrs Armenian Apostolic Church (5300 White Oak Ave., Encino). The route takes place along Ventura Boulevard, one of the busiest streets in the San Fernando Valley. Check-in on the day of the event begins at 11 a.m. and is required for each rider. For those under the age of 18, an adult must be present to check in. The event participation fee is $5, which includes a t-shirt. The bike rental fee is $20. Those under the age of 18 must wear helmets at all times. For questions or more information, please e-mail cycleagainstdenial@gmail.com. Those who wish to register can fill in the information provided on this link: https://docs.google.com/forms/d/12o-RZ8RbrLJqzOXOLFsuf6qzp2PMNWiMdOwdW18OMN0/viewform?c=0&w=1. 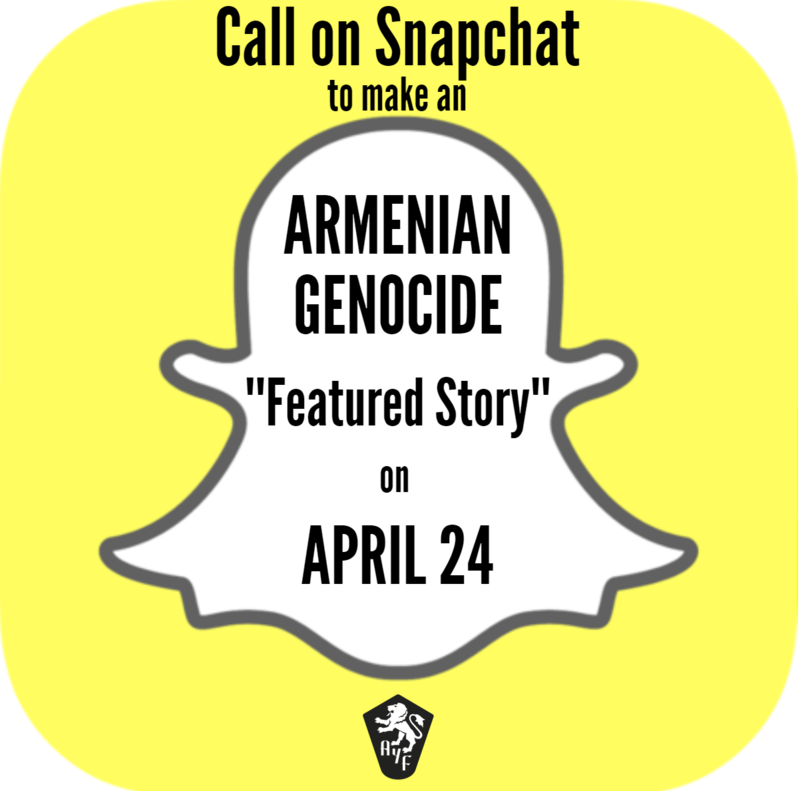 Call on Snapchat to make an Armenian Genocide “Featured Story” on April 24! Urge Snapchat to have an Armenian Genocide “Featured Story” on April 24. Send the following letter to Snapchat here. This year marks the 100th commemoration of the Armenian Genocide, the first genocide of the 20th century. Millions of people around the world will be commemorating this on April 24, 2015. Hundreds of thousands of people will be taking the streets all around the world to demand justice for the crime of genocide. They will also be paying homage to the 1.5 million victims of the Armenian Genocide. Celebrities like George Clooney, Kim Kardashian, and rock band System of a Down, to name a few, have been working to get the Armenian Genocide recognized in order to stop genocides from happening in the future by recognizing those of the past. We ask that Snapchat be a leader in human rights and justice around the world, and feature this worldwide demand for justice as a featured story on Snapchat. 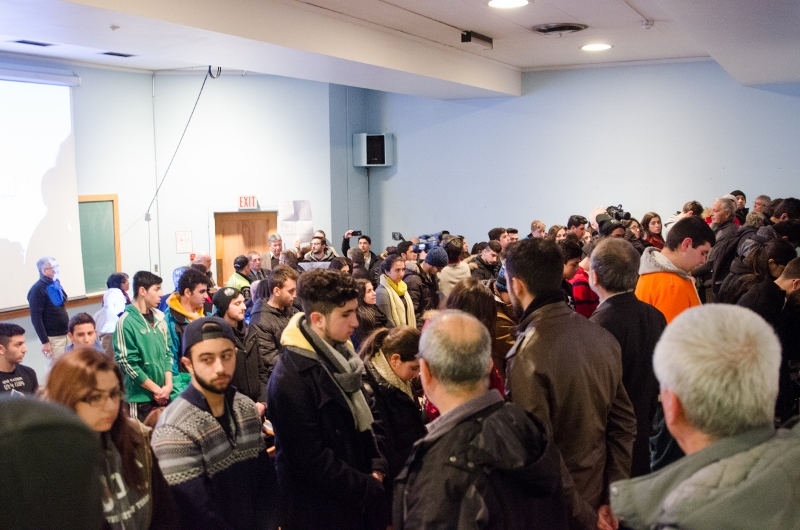 On February 27, 2015 the Armenian Youth Federation of Canada along with the local Armenian Student Association organized a protest while speakers and genocide deniers held a lecture at the University of Toronto, St. George Campus. More than 70 activists calmly stood up and turned their back during the lecture. Campus police were contacted but did not stop the silent protest, as it did not interfere with the event. Members of the Armenian Youth Federation – Western Region of the U.S. held a die-in protest on March 1, 2015, in front of the Staples Center in Los Angeles, California. Over 60 members from the Armenian Youth Federation lay flat on their backs with posters in their hands stating demands, quotes and other information regarding the Armenian Genocide. After the Lakers game finished, the attendees of the basketball game rushed out of the Staples Center to avoid the heavy rainfall, although many couldn’t resist stopping and taking a look at what’s going on. 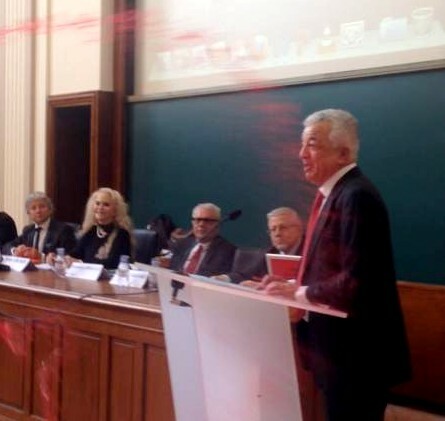 On March 2, 2015, during a talk on “Secularism in Turkey and France” at the faculty of law at Paris Descartes University, a member of the Armenian Youth Federation of France “Nor Seround” protested Turkey’s continued denial of the Armenian Genocide. The “Nor Seround” activist walked towards Ambassador Hakki Akil during the talk and threw a cup of pomegranate juice at Turkey’s Ambassador to France. All of these different forms of protests happened within a span of four days and each one incorporated a different method of protesting. The action taken on February 27, 2015 by the AYF of Canada was clear and directly aimed at genocide deniers. It was a silent form of protest but with the foe in the same room. Although, no form of direct communication was needed, they got their message across without subsequently negative consequences. AYF Canada’s protest at University of Toronto, St. George Campus. AYF Canada’s initiative was well received throughout the international Armenian community and quickly spread all over the social networks. The die-in protest organized by the AYF-WUS held a more indirect approach. The main goal that it served was spreading information and awareness to the masses of Los Angeles, California. No foe was present at the setting, the activists were not hurting anybody, and the protest was peaceful from start to finish. It was a more unassertive approach to a protest against denialist policies held by Turkey and even the U.S. government. Nonetheless, the activists got their message across in both Los Angeles as well as the international community through social media. This form of protest along with the strategic planning of the setting possibly reached out to the most people who did not know anything about the Armenian Genocide. AYF-France “Nor Seround” took a more radical route in their protest. They did not have 60 or 70 members at the place of the incident. All this form of protest took is one person. It had a clear and concise message. “Fascist Turkey! Justice for the Armenian people” was yelled by the protestor just after throwing pomegranate juice on the Ambassador which represented the blood that Turkey’s denialist regime has on their hands to this day. The news spread like wildfire all over social-media. Barely any negative comments and opinions were posted on the internet. Many praised the young Armenian from France and others even called him a hero. There were other protests this week as well, all relating to the pogroms in Sumgait, Baku and Kirovabad against Armenians living in Azerbaijan. Two were organized by the AYF of South America (Union Juventud Armenia de Sudamerica), one in Buenos Aires, Argentina, another in Montevideo, Uruguay and also by the AYF of Holland. The AYF of Armenia “HEM”, however, partook in the opposite of a protest. This group of young activists went to Artsakh with over a hundred members and showed support and solidarity with Artsakh’s population on the day which this atrocity is commemorated, February 27. The purpose of writing this article is not to compare and contrast different forms of protest. I believe that all of these initiatives were proven to be successful in their own ways; from raising awareness to the public by peaceful means, to a more radical condemnation on genocide deniers. I am genuinely happy for all of the protesters, activists and members that participated in all of last week’s events. The most important thing to understand is how crucial these protests and acts of solidarity are. Whether they are silent, or loud and disruptive, it does not matter. What matters is that there is action being taken to reach our goals. Many of these protesters do not understand how significant their roles were during these protests, but proof of these demonstration through pictures and videos on social media motivate the masses to their core. It gives people hope, whether they are living in the homeland or diaspora. These protests are sparks; enough sparks will create a fire. Let’s create a fire strong enough to light through the Turkish denialist machine and shed light on the Armenian Genocide. Join the movement, join the cause. It is imperative that we stand up to constant oppression and denial, together. 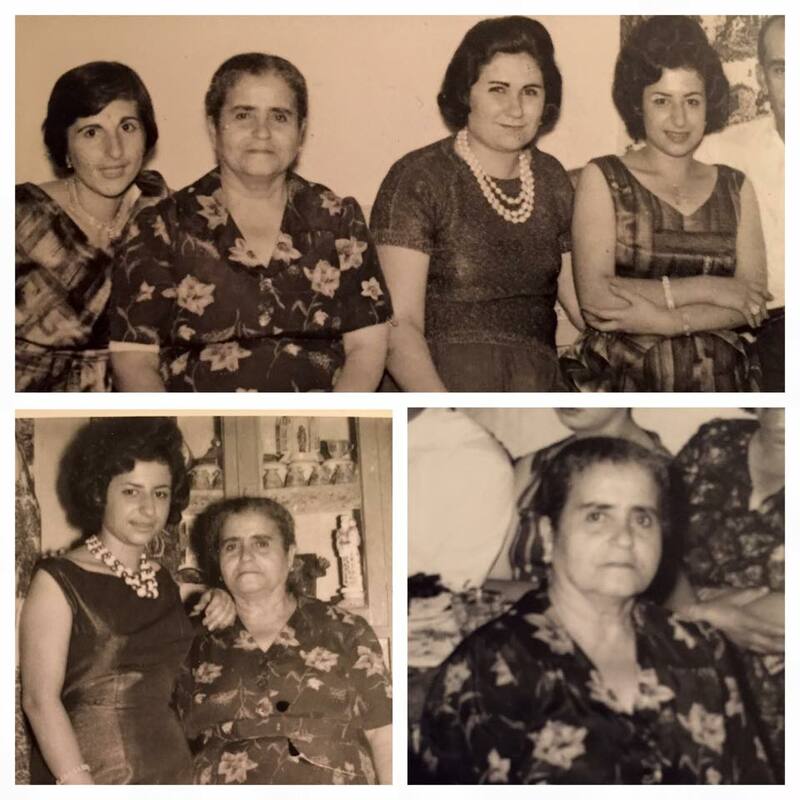 AYF member Krista Apardian’s great-grandmother Lousaper Tachdjian was only 8 in Aintab when she participated in her uncle’s wedding ceremony the night before two policemen came and told them to collect their belongings and moved them to the city of Hama in the mountains. They stayed there for 2-3 months with no food or water. Turkish soldiers would occasionally destroy tents and laughed and kicked the starving children who begged the soldiers for food. Lousaper’s family escaped by telling the soldiers they were going to the bath house. They eventually got to Salemia. When the father of the family heard about the men being rounded up to go to the army, they travel to Mahara with a mule. Their horsemen told some Turkish men about the valuables the Tachdjian family might have, which made the men beat the father with big sticks for the family’s items and money. They found refuge in a cave, where they spent some time before settling in Aleppo.